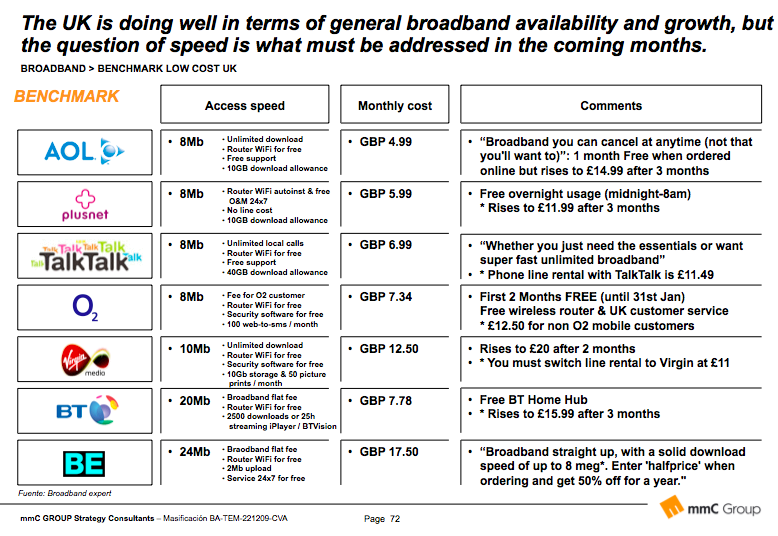 Trends in the U.K. Broadband Market for the next year. The UK broadband market is in a state of constant evolution and growth, as both private and public organisations push to get the fastest connections available to the largest number of people. Nearly 20 per cent of UK citizens are able to connect at high speeds in their homes and with the Digital Britain plan launched last year, by 2012 every single household should have a broadband connection of at least 2Mbps available. This aim for universal broadband is certainly an admirable one, but there are plenty of legislative and logistical hurdles to conquer as the plans progress. In 2010 the broadband market is expected to grow significantly and experts predict that more people will connect to the internet using fibre optic cables as opposed to the traditional ADSL technology, which requires standard copper landlines and offers lower theoretical maximum download speeds. An estimated 4 million households will have a cable broadband connection by the end of 2010 and BT is continuing to roll out its fibre to the cabinet technology in urban areas, providing faster speeds with less invasive installation requirements for the end user. At the moment the UK is doing well in terms of general broadband availability and growth, but the question of speed is what must be addressed in the coming months. It sits at 26th in the latest global league tables in terms of average download speeds, with South Korea dominating the charts by providing an average speed of 14.5Mbps for its citizens. This will be tackled in two ways in 2010, with cable broadband being joined by LTE mobile broadband by the year`s end. LTE (Long Term Evolution) is the next step on the road towards 4G mobile broadband and should offer considerably faster wireless connections than are currently available. Trials are being carried out by major UK network providers and mobile broadband will be used in areas in which the installation of fibre optic cabling would be unfeasible. The one benefit that the UK broadband market has over most others around the world is the low cost of its broadband packages. In terms of download speeds it may not be at the top of the pile, but ADSL, Cable and Mobile broadband deals are cheaper here than anywhere else in the world. The lowest cost broadband has become a key asset in the UK because of the maturity of its telecommunications networks and the highly competitive market which exists. Both ADSL and Mobile Broadband are provided by a number of firms, both small and large, all competing for the same users. As such the cost of the basic broadband packages has fallen to incredibly low levels. Some offer broadband free as part of a home phone bundle, whilst others cut out line rental payments or add sweeteners like free digital TV in order to entice over consumers from other networks. Broadband packages which are bundled with other communications and entertainment services have become popular, as has IPTV. With TalkTalk`s recent acquisition of Tiscali, BT has now got a serious rival to watch out for in 2010.